Home » Extremadura costume. Montehermoso, Cáceres Spain. FESTIVAL DRESS (DETAIL) Montehermoso, Cáceres. 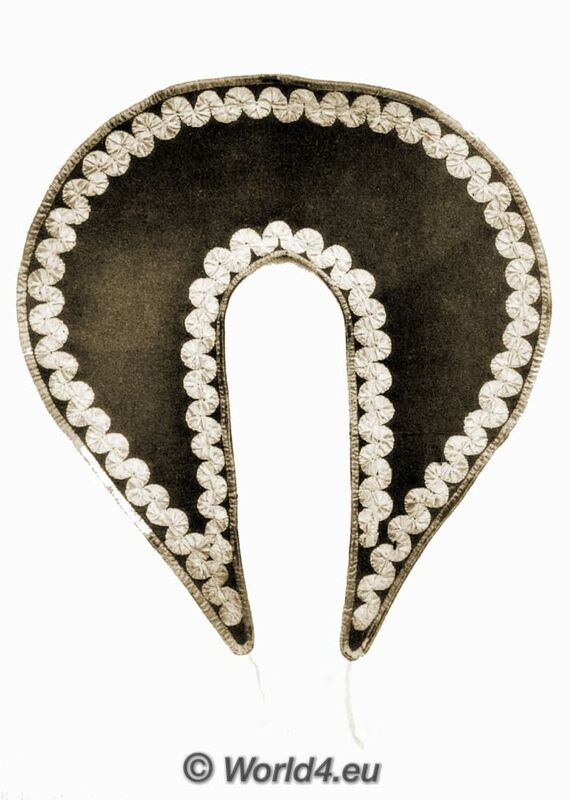 A large cross of gold filigree is worn on a silk ribbon tied about the neck. A medal of gold with black and white enamel hangs from a necklace of gold beads. 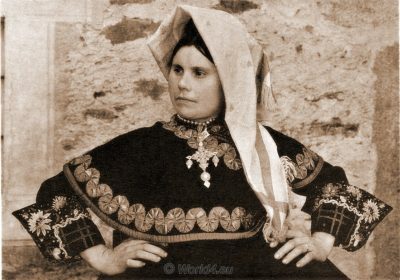 The large gold earrings are concealed by the kerchief. The woman wears on her head a kerchief of yellow silk, bordered with a stripe of red. A cape of black woolen material, edged with green silk ribbon and trimmed with a serpentine design of red silk ribbon, is crossed over a black sateen blouse, made with tight sleeves and large embroidered cuffs. A black apron is worn over a full pleated skirt of black and mulberry-colored flannel, faced with green. The hand knit stockings are of light blue wool, and the shoes, of black leather. The outer skirt is worn over six full petticoats which give extraordinary width to the hips. The petticoats are of flannel: mulberry-colored, green, orange, and white. The woman wears on her head a kerchief of yellow silk, bordered with a stripe of red. A cape of black woolen material, edged with green silk ribbon and trimmed with a serpentine design of red silk ribbon, is crossed over a black sateen blouse, made with tight sleeves and large embroidered cuffs. A black apron is worn over a full pleated skirt of black and mulberry-colored flannel, faced with green. The hand knit stockings are of light blue wool, and the shoes, of black leather. 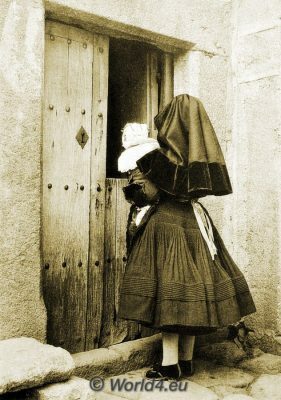 DRESS WORN TO CHURCH Montehermoso, Cáceres. 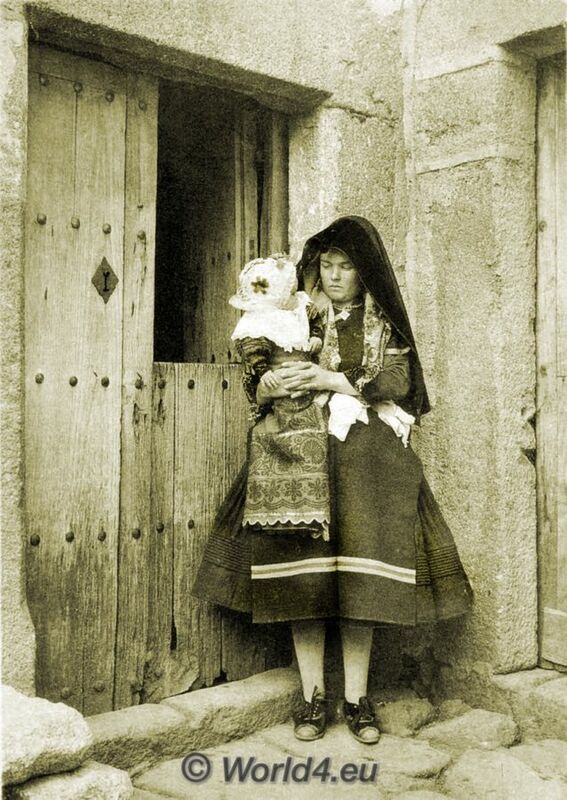 The mother has over her head the semi-circular cape which is worn to church by the montehermosena. The cape is made of black broadcloth, bordered with black velvet, and trimmed in the centre front with a tassel of black yarn. Under the cape she wears a kerchief of lemon-colored wool with a floral border of brilliant hues. 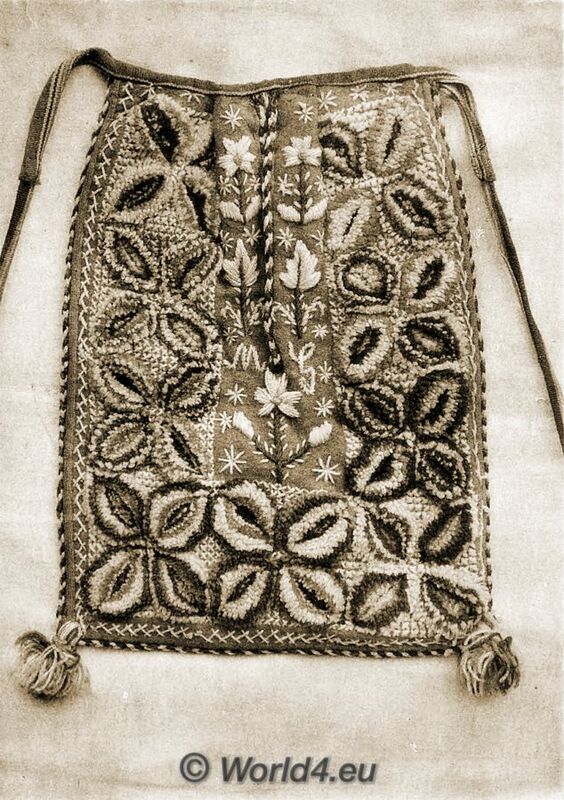 The ends of the kerchief hang down over a small mulberry-colored cape which is worn over a waist of black sateen. An apron of black homespun woven with stripes of blue and red is tied over a skirt of mulberry-colored flannel. A handkerchief is fastened at the waistline. Light blue woolen stockings are worn with black velvet shoes. The baby is dressed in a christening costume. He wears a cap of white lawn trimmed with rosettes of red ribbon and a bunch of colored flowers. A deep ruffle of white lace is gathered about the neck. The body is tightly wrapped in a cloth of red flannel figured in black and trimmed with gilt tinsel braid. DRESS WORN TO CHURCH (BACK VIEW) Montehermoso, Cáceres. The cape hangs in deep folds. The skirt, stitched with rows of horizontal tucks, stands out as though stiffened with wire. Colored ribbons are fastened at the waistline. FESTIVAL DRESS (BACK VIEW) Montehermoso, Cáceres. Ribbons of pink silk hang down the back of the cape. The sash ribbons are blue and rose with coloured figures. A kerchief of rose and white silk edged with fringe rests upon the high chignon. A black cape trimmed with red and green is worn over a blouse of black sateen. An apron of black homespun partly covers the pocket, worked with rose, green, and yellow wools, which is tied about the waist over a full skirt of mulberry-colored flannel. 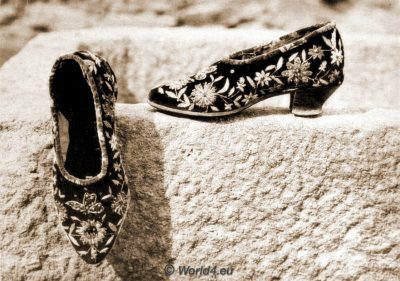 Light blue woolen stockings are worn with shoes of black velvet embroidered in silks of many colours. A pocket (faltriquera) of red woolen material is embroidered in wools of many different colors: rose, green, and yellow predominating. 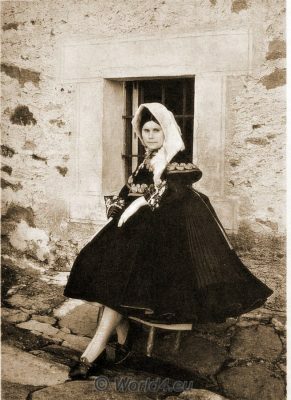 The pocket is tied about the waist and worn on the right hip under the apron and over the skirt. The cape (esclavina) of black woolen material is edged with bright green silk ribbon and trimmed with a serpentine design of red silk ribbon. 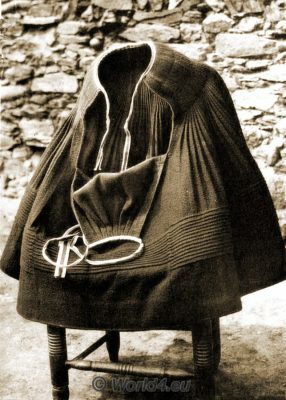 When the cape is worn, the right side is crossed over the left, and the strings are tied at the waistline in the back. 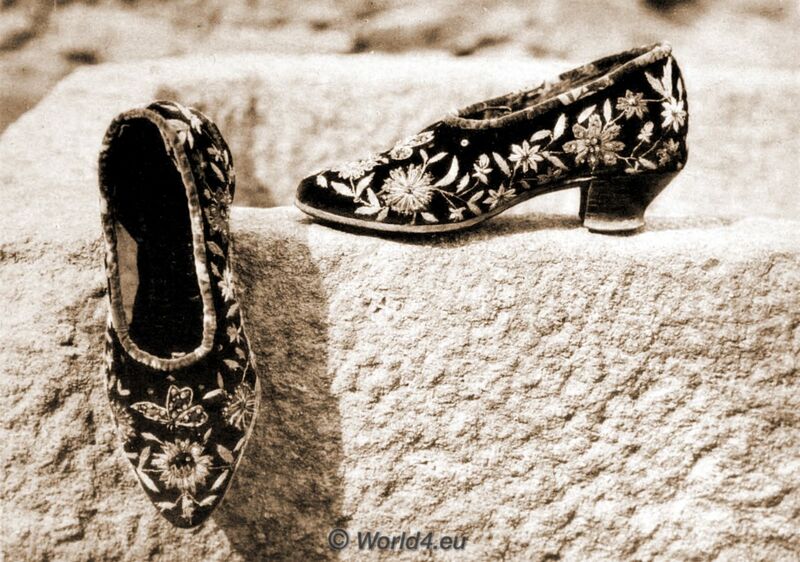 The shoes are made of black velvet embroidered with spangles and bright-coloured silks. The upper edge of the shoe is bound with figured velvet. A skirt of mulberry-colored flannel is pleated at the hips and tucked in horizontal rows above the hem. The pleats are held in place with three rows of black stitching. The top of the skirt is finished with tape striped in red, green, and yellow. The opening is placed in front. In adjusting the skirt the back tape is tied first, and then the front flap is fastened in place. 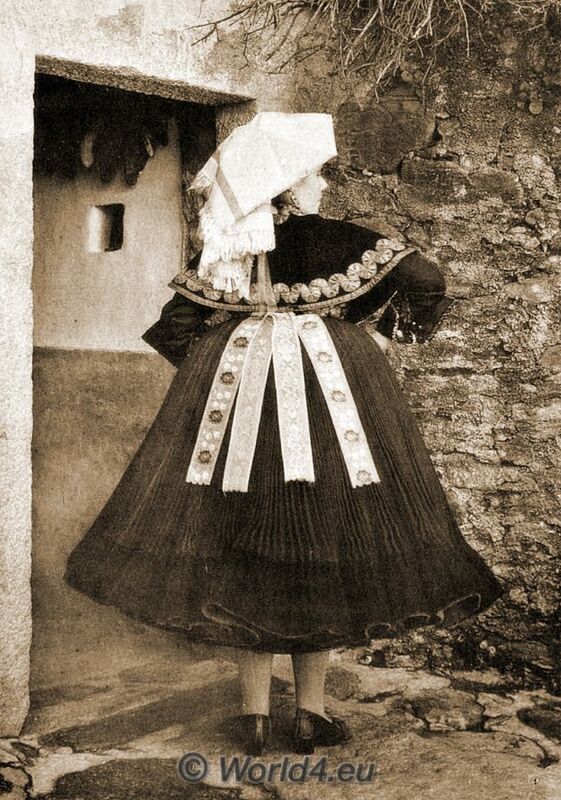 Source: Extremadura costume: Women’s festival dress at Montehermoso, Caceres. 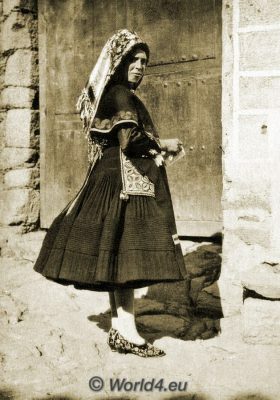 Illustrations from Photographs in the collection of the Hispanic Society of America. Montehermoso is a Spanish city in the autonomous region of Extremadura. Montehermoso is located in the province of Cáceres. This entry was posted in 20th Century, Spain, Traditional and tagged Traditional Spain costumes on 5/20/17 by world4.